Local Haines politics has gotten pretty intense lately. A group of Haines residents is trying to recall half of the borough assembly. 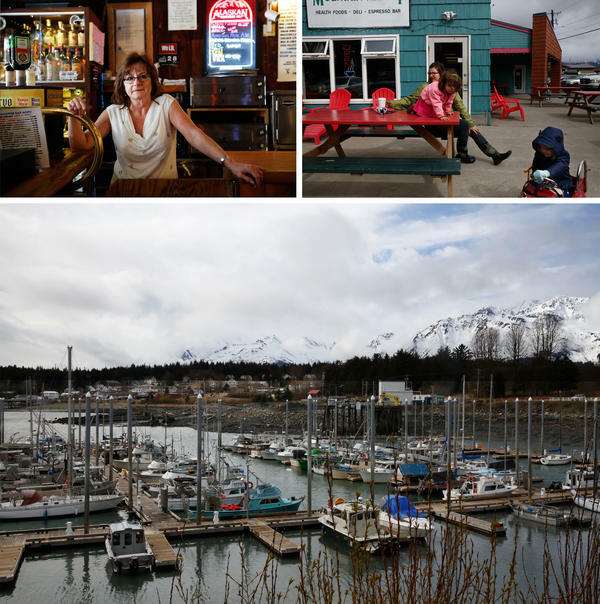 Top left: Carole Ridge, a bartender at the Fogcutter bar. Top right: Candice Mustard-Scott, with her daughter, Ella, and a friend. 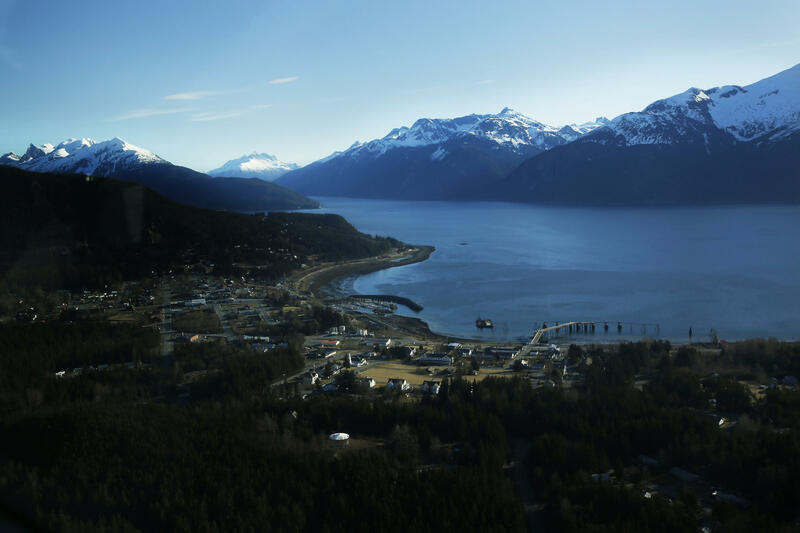 Bottom: The harbor in Haines. Right: Shane Horton is one of the men who's circulating the recall petition. He owns a motel, and drives a snowplow. Left: Heather Lende is a writer who was just elected to the borough assembly last fall — she's one of the targets of the recall. Haynes Tormey and his wife, Katie. 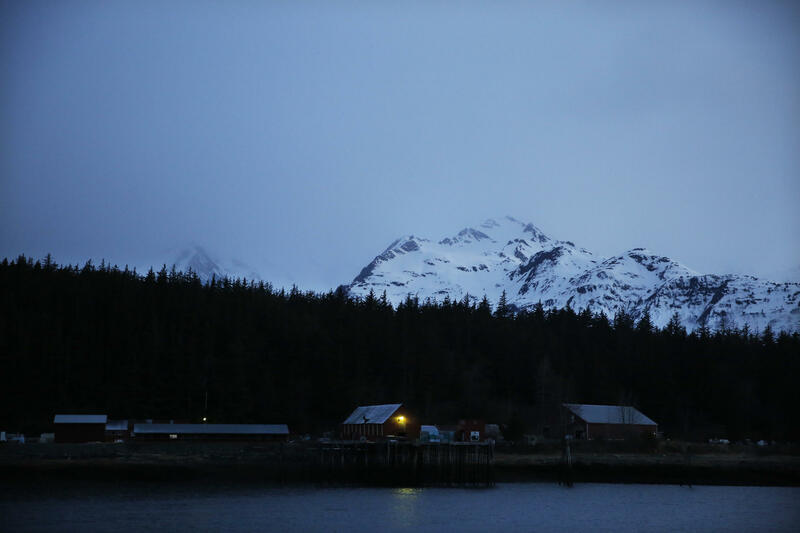 Haynes moved back to Haines, the town where he grew up, and is now a mechanic and commercial fisherman. Right: Joanne Waterman just retired from working at the ferry terminal in Haines. Left: Dave McCandless, a family physician in Haines, has seen these same tensions in other places he's lived. Life goes on in Haines: Friends at lunch inside Mountain Market, a cafe and grocery store. "We'll bounce back and we'll be different," says Joanne Waterman. "But you know? We'll still be a community that, at the base of it — at the heart of it — we love each other." But lately, this idyllic place has been roiled by a bitter political battle. A group of residents wants to recall more than half the members of the local government, the borough assembly. In the 2016 presidential election, Haines split right down the middle: Hillary Clinton eked out a four-vote margin of victory over Donald Trump, getting 374 votes to his 370. To better understand this community, and to find out what all the fuss is about, we gathered a small group to talk about their lives. On a weekday evening, they gathered in a circle at the community center. Among those who came: a motel owner, a fisherman ... and one of the targets of that ongoing recall effort. Shane Horton is the motel owner. He also drives a snowplow, and he's circulating that recall petition. "This is kind of like a family, it's typical of a very dysfunctional family," says Horton. "There is little but dissent around here, for the most part." Heather Lende is a writer who was just elected to the borough assembly last fall — she's one of the people Horton and others are trying to remove. When she heard that some in her community were trying to oust her, "it was heartbreaking." Social media makes it worse, Lende says: People in Haines are saying things online they wouldn't dare say in public in such a small town. Haynes Tormey shares his first name with the town where he grew up. He's a mechanic and commercial fisherman and, at 34, he's the youngest of our group. He moved away from Haines, but recently decided to move back, with his wife, Katie, and four kids. It's a different place than he remembers. Angrier. Louder. "It's a pretty hot political climate here," says Tormey. "It's like a petri dish! Haines is following footsteps with what's happening in our country. The rhetoric and the volume has been turned up ... I'm scared that it's never gonna stop and I don't think it's a healthy way to live." That gets nods of agreement around the room. So what's at the root of all the contention? Sure, some people are upset over local issues, like a harbor expansion or who should be the new borough manager. But it's about more than that. It breaks down as old-timers versus newcomers, to some extent. But also, people who want resource development, like mining or logging, against "greenies" — environmentalists who stand in the way. "One of the things that make ornery, bitter old farts like me," explains Horton, "is that I came here and was doing construction and dirt work involved with the timber industry. And that went away. So I went into doing something else, and then that gets blown out of the water. How many times can I get told to completely start over because what I am doing is now not acceptable?" For people in Haines, maybe it's a question of who are we now? What's our identity in this place that's changing? Dave McCandless, a family physician in Haines, has seen these same tensions in other places he's lived. "I think we're actually hardwired to judge things around us and decide if somebody is one of us or one of them," McCandless says. "But once you decide somebody's one of 'them,' it's real easy to you know, switch over and say, 'Well, if I disagree about this, maybe I disagree with him about everything. And suddenly I can't find any common ground.' 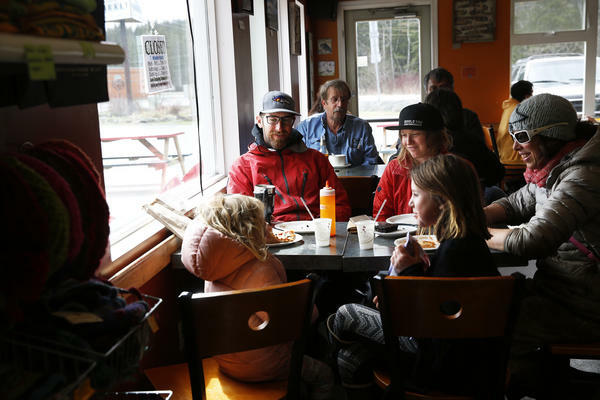 "
That common ground has been elusive in Haines lately, but Heather Lende says, despite the recall effort against her, she's optimistic. She's a liberal, and has very close friends who are Trump supporters. 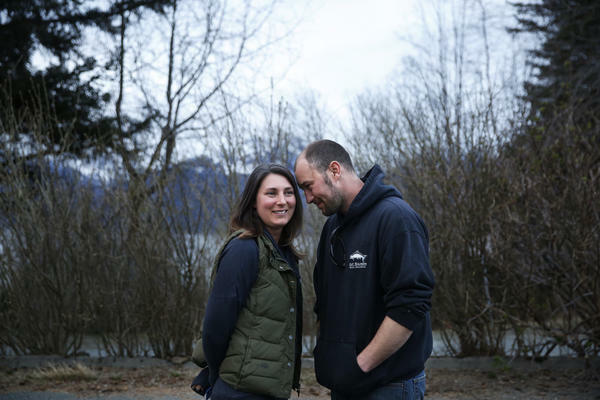 "I'm not gonna lose a friend over whoever votes for someone in the national election," Lende says, "and maybe that's the lesson that can come from Haines for the rest of the world. We've lived with divisiveness for a long time, but is it worth losing a friend over? I don't think so." Doc, as the group affectionately calls him, sees it every year: Anger builds through the long, dark winter months, he says, "and February, March, April is when people kind of fall apart. The holidays are over and it's a long time till spring." Shane Horton laughs. Yep, that sounds about right. "When I first came to Alaska, that was basically a kind of a joke," says Horton. "About March, there was a whole slew of divorces and screaming arguments and everybody switched ... Traded vehicles, bought a new truck. Ended up with a new wife and everybody took off and struggled through another year again." Joanne Waterman, who just retired from working at the ferry terminal calls it "spring breakup." "We will go through these times," she says. "We will fight, we will scrap, we'll go to the bar and have a beer together. And we'll bounce back and we'll be different. But you know? We'll still be a community that, at the base of it — at the heart of it — we love each other." Dave McCandless says he's sure this current climate will pass: "What you're seeing, this tension and this turmoil and all that, it's all happened before," he says. "This country has been full of that, just like the town is full of it. Three years from now we'll be arguing about something else just as feverishly. And we won't be able to remember what this was." If you should fly into Haines, Alaska, you'll be on a propeller plane so small that your pilot will call the roll. INSKEEP: Just 2,500 people live in Haines, but lately, this idyllic town surrounded by water with snowy mountains and lush, green forest beyond has been roiled by a political battle because a group of residents wants to recall more than half the members of the local government. NPR's Melissa Block was on that little plane. You heard her name called out. 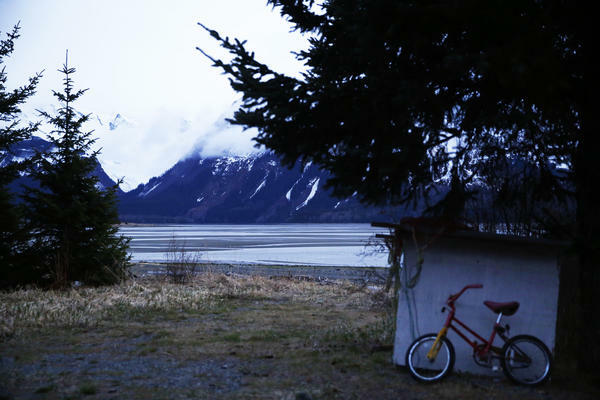 She was visiting Haines for her series Our Land. UNIDENTIFIED WOMAN #1: Hey, Shane. UNIDENTIFIED WOMAN #2: Hi, Shane. BLOCK: ...One of the men who's circulating the recall petition. SHANE HORTON: I have a petition to get rid of you out in my truck if that would help, but no (laughter). BLOCK: That's Shane Horton. He owns a motel and drives a snowplow. I ask him, so what's the deal with all this division? HORTON: (Laughter) Well, this is kind of like a family. It's typical of a very dysfunctional family. There is little but dissent around here for the most part. HEATHER LENDE: I felt like - this has never happened to me, but it was the closest thing I've had to feeling like I've been married for 34 years and suddenly my husband cheated on me. It was heartbreaking. BLOCK: And social media makes it worse, Lende says. People in Haines are saying things online they wouldn't dare say in public in such a small town. Haines Tormey chimes in. He shares a name with the town where he grew up. HAINES TORMEY: It's a pretty hot political climate here. It's like a - it's like a petri dish (laughter). BLOCK: Tormey is a mechanic and a commercial fisherman. At 34, he's the youngest of the group. He moved away from Haines but recently decided to move back with his wife and four kids. It's a different place than he remembers - angrier, louder. TORMEY: Haines is following footsteps with what's happening in our country, I think. The rhetoric and the volume has been turned up. BLOCK: That gets nods of agreement around the room. So what's the root of all the contention? People erupt over local issues like a harbor expansion or who should be the new borough manager. But it's about more than that - old-timers versus newcomers, to some extent; also people who want resource development, like mining or logging, against the greenies, environmentalists who stand in the way. HORTON: ...I was doing construction and dirt work involved with the timber industry. And that went away, so I went into doing something else, and then that gets blown out of the water. How many times can I get told to completely start over because what I am doing is now not acceptable? BLOCK: Maybe it's a question of who are we now? What's our identity in this place that's changing? Dave McCandless, a family physician in Haines, has seen these same tensions in other places he's lived. DAVE MCCANDLESS: I think we're actually hardwired to judge things around us and decide if somebody is one of us or one of them. But once you decide somebody is one of them, it's really easy to, you know, switch over and say, well, if I disagree about this, maybe I disagree with them about everything. And suddenly, I can't find any common ground. BLOCK: That common ground has been elusive in Haines lately. But Heather Lende says despite the recall effort against her, she's optimistic. She's a liberal and has very close friends who are Trump supporters. LENDE: I'm not going to lose a friend over who ever votes for someone in the national election. And maybe that's the lesson that can come from Haines for the rest of the world. I mean, we've lived with divisiveness for a long time, but it's like, is it worth losing a friend over? I don't think so. BLOCK: And Dave McCandless, the doctor, says this dissension, it's normal in small-town Alaska. He sees it every year. Anger builds through the long, dark, winter months. MCCANDLESS: And February, March, April is when people kind of fall apart. The holidays are over, and it's a long time till spring. BLOCK: Shane Horton laughs, yeah, that sounds about right. UNIDENTIFIED WOMAN #3: Except for the truck maybe. HORTON: It went on that way an awful lot, and it was just because people are nuts when they get through with a long winter. BLOCK: That's Joanne Waterman. She's just retired from working at the ferry terminal. WATERMAN: We will go through these times. We will fight. We will scrap. We'll go to the bar and have a beer together, and we'll bounce back, and we'll be different. But, you know, we'll still be a community that at the base of it, at the heart of it, we love each other. BLOCK: But remember Haines Tormey who moved back here with his young family? He's rethinking that decision. TORMEY: All the time because I'm scared that it's never going to stop, and I don't think it's a healthy way to live. MCCANDLESS: I guess what I really want to do is reassure you. MCCANDLESS: What you're seeing, this tension and this turmoil and all that, it's all happened before. This country has been full of that just like the town is full of it. But what will change is your way of thinking of it. OK? You'll come to grips with that. Three years from now, we'll be arguing about something else just as feverishly, and we won't be able to remember what this was. BLOCK: But there will be something else that you'll be arguing about. BLOCK: Melissa Block, NPR News, Haines, Alaska. Transcript provided by NPR, Copyright NPR.